As I mentioned previously, ornamenting your felted bags need not be time-consuming or expensive. 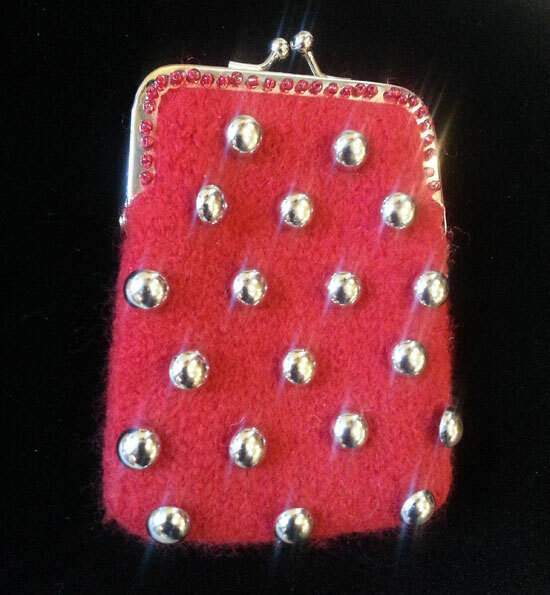 I have taken a liking to cabochon rivets and use them to decorate bags, my ready-made clothing, my knitted coats, my boots. They are a nice, quick way to add both interest, sparkle, and a pretty cool look to almost any bag. Here, I’ve used them in an off-set pattern on the front of the little bag we’ve been visiting for a couple of days now met. This is, in my opinion, like the flower we saw yesterday, an example of better. And for some bags, this would be the BEST. While you can go hunting for specialized tools with which to set these special rivets (and I even sprang for the expensive tools, I confess, but didn’t like using them and found the setting process to be frustrating and laborious), you don’t have to. I have experimented with a few different methods and find that superglue works really well to attach these rivets. Get a little bottle of Locktite Superglue. I prefer Extra Time Control. Place all the rivets where you want them and satisfy your eye that they are just right. If not, re-locate. Snap the front cab part (the female part) to the back (the male part) and wait for the click. They are placed, at this point, but not set. To set, I twist off the cab front, put a drop of glue in the receptacle and click back in place. Hold for a few seconds. I work systematically so I know which rivets are done and which are not. Let sit for a bit and you are done! Where do you get Cabochon Rivets, you might be wondering? Noni has cabochon rivets in 3 finishes: antique brass, gunmetal, and nickel (pictured above). Call to place your order. This entry was posted in bags, Nonibags by njbellows. Bookmark the permalink. I have purchased your pattern for the Lipstick and Coin bags but cannot find a source for the handles. Please help. Thank you Nora. Just spent time looking for business card case ideas for my daughter how clever…wish I had thought of it..